This 2015 link elaborates my spherical vortex rationales and my construction methods based on leapfrogging from primitive to evolved, by means of integrative tracing. The works of suppressed benefactors like Nikola Tesla and others, have long inspired me. 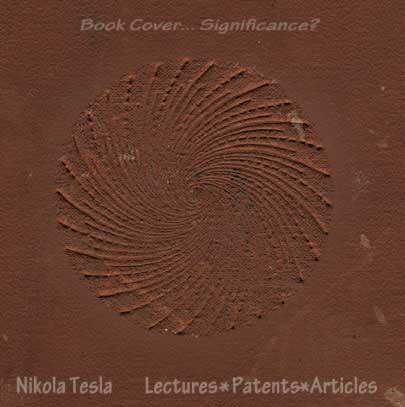 A favorite Tesla book cover displayed an interesting graphic. 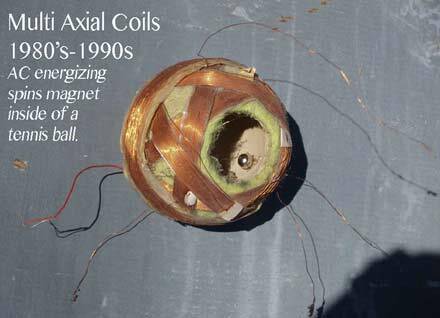 One of my interpretation was modeled to the right, but with coils... My flexible magnetic cores were partly made from magnetic-recording-tape. (Magnetic-tape recorders were the state of popular, audio recording, in those days- the 1980s. 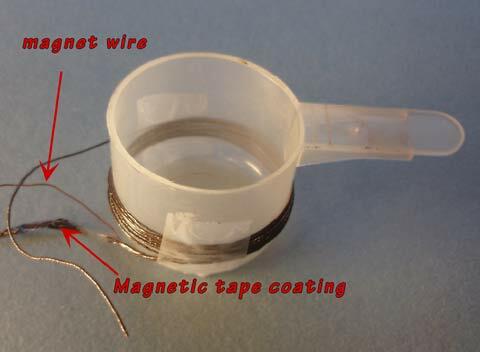 The magnetic tape is easily wound on objects.) . I looked for subtle effects like harmonic reactions with weak currents. I wondered why Tesla's remarkable invention progress had 'stopped' suddenly, long before his passing from our world... Why? I wondered if some patents had been removed from the public record. I could not afford a book search which was expensive in those (pre-web) days. Nor could i spend much time away from my low income vocation (rural-laborer-contractor). For my electronics, experimental interests, i had set up a small and humble workbench. I was fascinated by coil geometries. Why not a tri-axial-core application to the cube, (having with three axes). I explored the concept of "the right hand rule". I began winding coils to explore the this orthogonal relationship of fields. For some reason (unknown to me) terms like 'orthogonal' have not found a popular application in the fields of electronics. Perhaps it is because integrated circuitry is slow to enter the more complete, NURBS ("non rational b spline"), curvilinear, geometric freedom of shapes and patterns, (within the manufacturing processes used). It would seem to me that raster-ized and layered lithography, in some form, is still the method of printing on chips. (These are primarily geometric- artistic terms, injected into an industry which i have not really studied much). For experiments, i grabbed any available scraps from surplus outlets, junk yards and broken appliances. I cobbled together interesting shapes which arrayed together diverse alignments. To see what ordinary inputs, might engage in the outputs. To some extent, this followed the coil-arrangements called 'transformers'. Except that the angular arrangements were my focus here. The coils to the right, above, were salvaged from old CRTs (from really old TVs). My focus has also been patterns in nature. What some people like to call "sacred geometry". I would rather just say nature's patterns (and avoid religious complications). I found that cosmological concepts shared electronic principles in the form of plasma. The art of weaving baskets also provided a fascination for me. 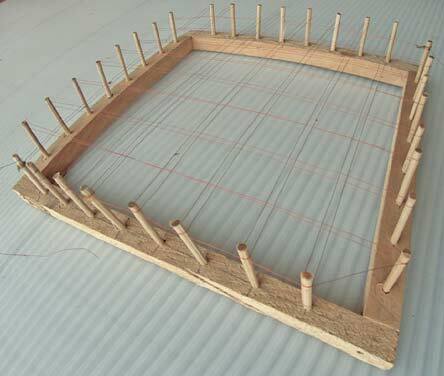 This craft has long included elliptical and spherical weaving. Using strands of natural and later some synthetic materials. Knitting as an important geometric art form deserves credits too. An immediate challenge arises with spherical weaving: How shall the increasing surface area towards the equator interface the decreased area closer to the poles? The emphasis of this question concerns the weaving materials which are typically of uniform cross section, along the full length of the material. Purposively, my challenge was to layout all coil material in single layers, with minimal overlapping. (Essentially to minimize or otherwise take advantage of overlaps, as experimental evidence, might inspire). Is it possible to achieve a coil mappings, with these objectives? These are 2 coil winders i built for winding coils along continuous wires. Using a fine, spherical, woven basket, from Thailand, i was inspired to experiment with isotropic coil alignments. 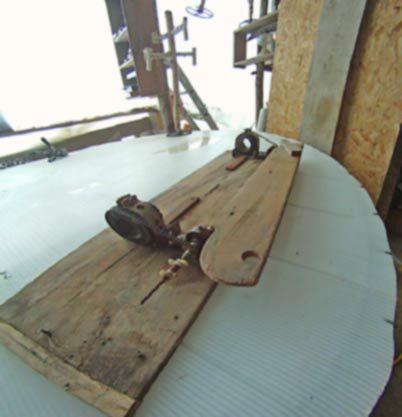 I used an ordinary handyman drill with a long shaft, to wind a long copper coil. It slipped off afterwards and allowed me to sub-divide it into many segments in serial fashion. Next i salvaged some windshield putty which permitted sticking these segmented coils in series. Next i molded these continuously inside the basket. My intent was to resonate fields isotopically. To observe what if any interactions would occur with other coils in my collection. The alignments of these coils can be aligned or opposed. In the 1980s, i could only visualize these concepts in a hand drawn form. poles or oppositely aligned See some other coils, of that period, as posted here. My generalized method and testing are also on that page. In 1993 , i was finally learning uses of CAD in DOS and Windows 3.1, on my first clunky computer. My first 3D software was called SilverScreen. (A true solids modeler, which was a significant and an expensive distinction in those days. DOS was the main operating system for affordable 3d). My primary fascination with this software, was it's ability to rotate 2d profiles around 3d axes. In the early days of the internet, there was a forum i joined called 'vortex'... I offered the essence of this concept there. A couple of people corresponded with me for a while, about this. Later i lost touch with them. I bought some 'paint-able', conductive epoxy and also smoke non-conductive ceramic material from Cotronics. These materials were pretty expensive for me. My intent was to successively paint, layer upon layer to form a spherically folded coil. Paint a ceramic layer, then a conductive layer, successively, until the material was used up. Providing as many layers as the small jars would allow. By the time i got around to this, the materials had hardened up. So wait until next time. Not to worry i imagined. I'll just try and fold together a poor man's "pole-coil". 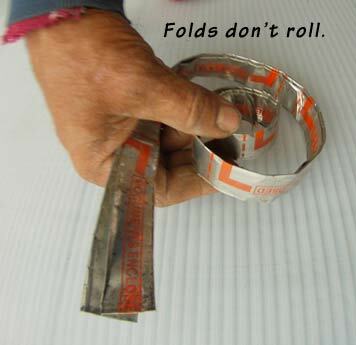 Pole coils are folded or laminated, instead of wound. Above example studied the issues of properly conductive seams. The poor man's insulator was used VCR tape (from trash). This can add inductance. As the typical inductance per gram is significantly less than with ordinary helix-style coils. 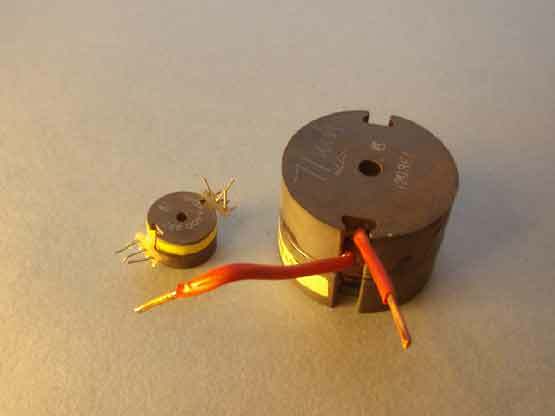 Low inductance tends to better serve higher frequency applications. Which is an interesting new feature of structure combined with frequency band issues. Much higher numbers of layers than illustrated are also an objective for practical experimentation. However, the crimped-seams provide uneven electrical connection issues. So i lost interest in building, until better electric- connections could be made between these concentric conductors could be made. Until much better conductive uniformity can be assured. Where the conductive path ought to be made equal throughout the conductive path cross-section, (at every point). 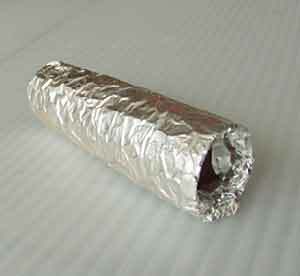 Folding one piece of foil, alone, to achieve this objective, meets with unwanted creases. Since foils do not stretch or compress. My 3d geometry software, formZ, illustrates the reversing spin of the magnetic fields in one coil, (below).My expectation (hypothesis?) is that more of a beam or pole shaped magnetic field will develope. 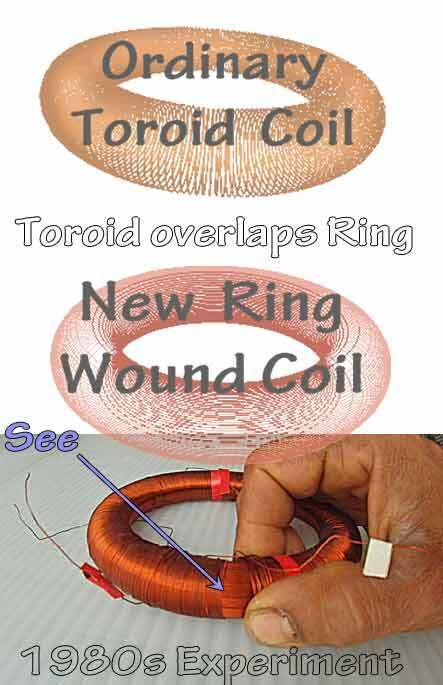 Instead of the toroidal field developed by the helix-wound coil. With my favorite design software, formZ, i have since been able to advance the illustration of the reflexively orthogonal coil concept. It's smooth-geometry tools seem to be from an advanced technology of http://www.spatial.com. I'm just grateful that it seems to smooth out the earlier 'facets' of facetted geometry To simplify curvature. Faceted geometry seems to be based on human experience in building with stick frames and flat cladding materials. Facetted geometry still serves the challenges of building with ordinary materials. Example Above: Reflexive-concentric-magnetic cores are mu-metal, (a ferromagnetic, nickle alloy). Sheets for laminating the magnetic cores, were used in the image above. The conductor path was substituted-- The concentrically laminated conductor path concept has been substituted with copper magnet wires. 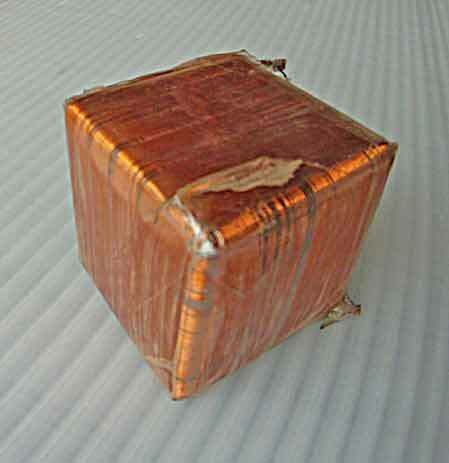 The serially-concentric folds are replaced with a copper coiled conductor. The effort is still a bit crude, but provides experience to consider improvements. As the 3d model below shows, the copper windings sharply reverse direction at the rims of the magnetic cores. The like- magnetic- core- polarities protrude at opposite ends. Inspired exploration comes from difficulties of physical building. Below appears the pole coil conceptually bent in the manner of a torus overall. Although cut away for initial visualization. Is there any end to folding, twisting or bending? I used to think a good end would be discovery of a new force manifestation. A force fitting hand to glove, as in the so called"Right Hand Rule". Press on i say. Frankly, the bending of the pole coil, into a toroid of entirely new alignments, would, in my opinion, be a blast to build and energize. Wolfram offers alternate names, but i am actually suggesting different concepts and applications. I am suggesting a succession of relationship between spheres and tori. Or an application of tori field formations and field inversions which pass through a spheric stage of succession. 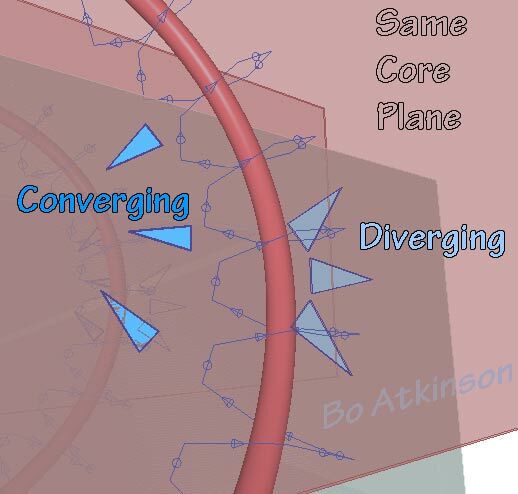 Following is a very generalized, suggested field inversion of the the torus, even in terms of magnetic lines of force-- As a simplified visualization of the expected geomagnetic field reversal. 2015 Article detailss scalar orbiting. Note: the static image version was added April 2015: Original, 2012, gif animated version is here. My 2 cents on magnetic reversal and how the surface of the planet can manifest multiple north and multiple south poles simultaneously. What may happen is that the "toroidal field" displayed at the beginning of the video literally self-penetrates during the process of reversal. 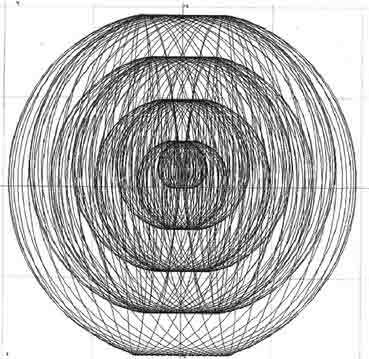 Such that the conceptual, toroidal, main ring~body is in essence, the motion-movement, (or the earths orbit). Whilst the conceptual coil circulating the orbit ring is magnetic flow we observe with compasses. Earths electric field might thus trace the gravitational field-- In the form of something like "charged particles". Strangely enough it might also fit, as a 3d representation of the so called "vesica piscis" . I'm not asserting familiarity with the term but see google has 163,000 results at this writing. For the two terms: "vesica piscis" + 3d ....google lists 41,100 results. Wolfram seems to assert only a "2d" math to the term. There are some remarkably diverse applications of "self intersecting" features, when applied to 3D modeling. I plan to add a page introducing some of my geometric discoveries here. (Link to be added here). I am exploring visualizations of coils and field interrelationships. This linked page features newer modeling displays from formZ architectural software. Next below is an effort to study the concept of a " transversely-wound-toroid". Transverse, in this case referring to an attempt to swirl the magnetic core flux. Again, the effort is to situate all portions of the windings along the toroidal surface. Also to leave, little if any surface portions, uncovered . (Or having a minimum of gap space between windings, while remaining toroidal, overall.) This apparently may increase current capacity through spacial efficiency and also increase capacitance as, providing electrical insulation is maintained. The above model is difficult to model in 3d. It used a Line-of-Intersection with a spiral projection. Hence there are some randomly spaced gaps. With more effort applied, a goal could be set to minimize gaps. Furthermore, the 'pitch' of these gaps could As a first try, it can be seen, that for more consistent coverage, we still have huge gaps in the torus center. I plan to add more torus related concepts here in the future. In the past, one of my goals was to attempt mastery of Finite Element Analysis software (FEA). To test my coils and observe the outcomes. A variety of soft wares came to the market as i began using the internet. The pricing was prohibitive for software which purportedly calculates and displays electronic induction in coils. Besides, it soon struck me that these soft wares were based on fairly linear models and could not predict new, discoverable phenomena. Following are some experiments i did. The observations need a lot of going over and repeating with better equipment. I tried doing YouTubes at it's inception, but my camera couldn't produce the right format. Now with better cameras, i should record some experiments too. Lots to learn in this respect and to re-construct some experiments. Here are some threads i posted, (@ Avalon Forum). As life life may permit it, my experimentation may continue, some day. The fact is that i feel my life was threatened, as in this example, linked here. I would not call it paranoia, but rather a combination of playing more carefully with fire, on my part. Besides the need to make a living with profitable trades. So my coil investigations collected dust for many years, but my turn towards geometry software, did allow my mind to wander into unexplored territory. I will attempt to post more of my geometries on this page. ".... Scientist today think deeply instead of clearly. One must be sane to think clearly, but one can think deeply and be quite insane. Today scientist have substituted mathematics for experiments and they wander through equation after equation and potentially build a structure which has no relation to reality." This quote seems to honor the "arts of exploratory building"... As in experimental-coil-building followed by energizing and observing. I experimented with a variety of spherical coils. 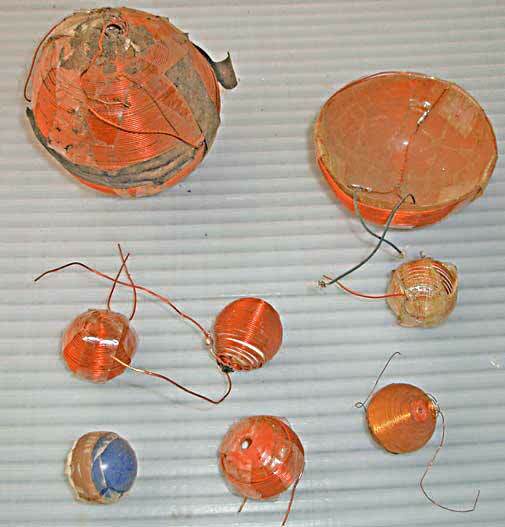 The above coils were wound upon hollow plastic balls. 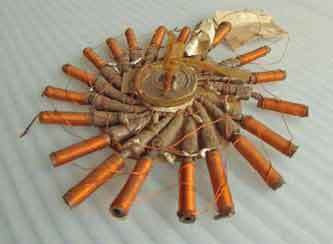 Various fillers were used to enhance the coil inductance. The smaller balls were small enough to fit inside the larger balls. To observe mutual inductance relationships. To twist the mutual coil axes. A tennis ball, in picture below ,itself had coils of differing axial angles wound. Various interconnections were made to explore effects of differing axes connected together. 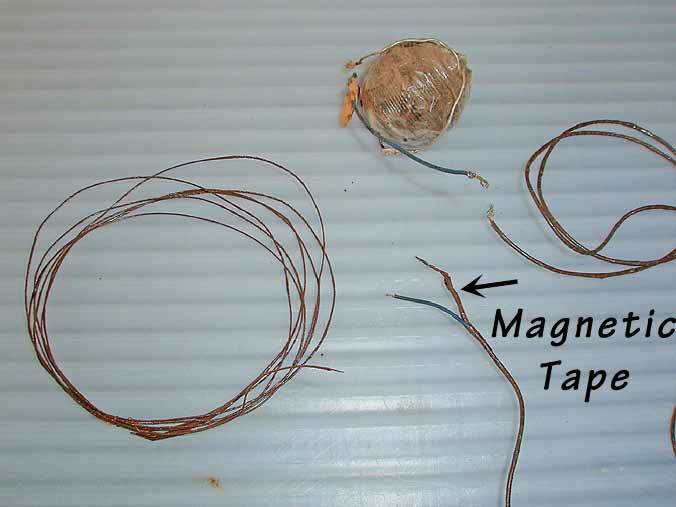 A ball- magnet is shown inside the ball- coil. Connection to AC causes the magnet to jump around. However, this sort of jumping can be observed with small magnets, placed inside hollow containers and placed next to or on top of almost any energized coil. 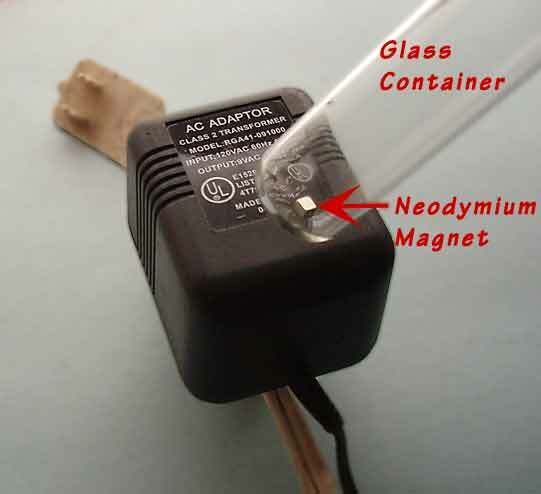 Next below is a picture of a small magnet which jumps around when placed on a small, energized power transformer. I'm an adventuresome artist skipping past fuller testing and experimentation. This year i am updating this page to reflect my past thinking and dabbling. I ignored these experiments for decades while learning to use early computers, web skills and making a laborer's living. I skip over math definitions to contemplate various orthogonal field relationships. Of fields encircling fields. Or flows of fields coiling around flows of fields. 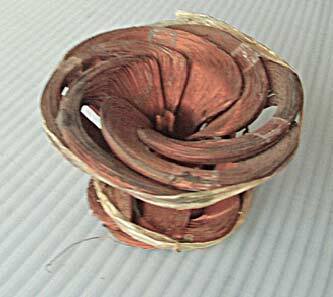 Winding coils upon coils usually took the form of copper wound on a paramagnetic wire. I spent countless hours piecing together gizmos to wind coils upon continuous wires. I like to call this helical-orthogonality. 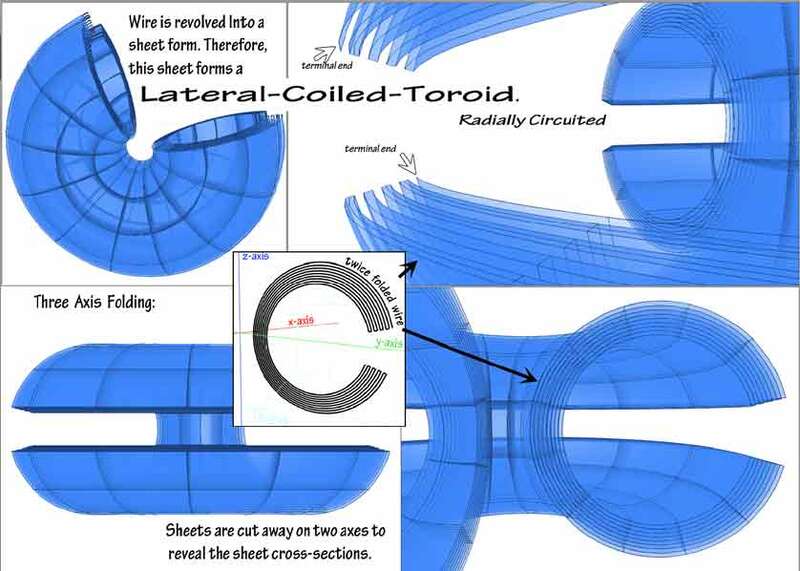 Additionally i have found other applications of this generalized geometry of coiled-coil-windings. Linked here is more background. This provides for both an internal and an external core-effect-- Wind magnetic materials on copper wire-- With the concept of reinforcing the magnetic flow completely-around the the copper conductor. 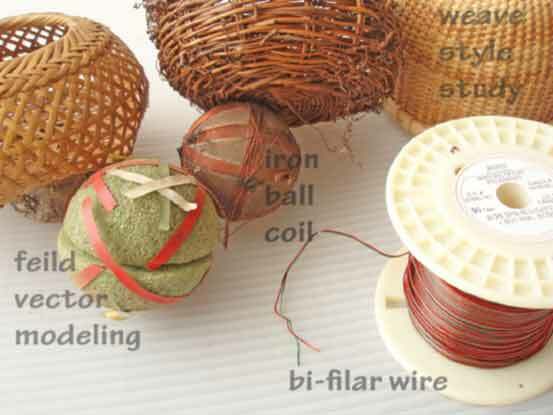 Then use that magnetically-covered wire to wind upon varied cores. The use of audio-recording-tape was tried both to explore frequency-characteristics. 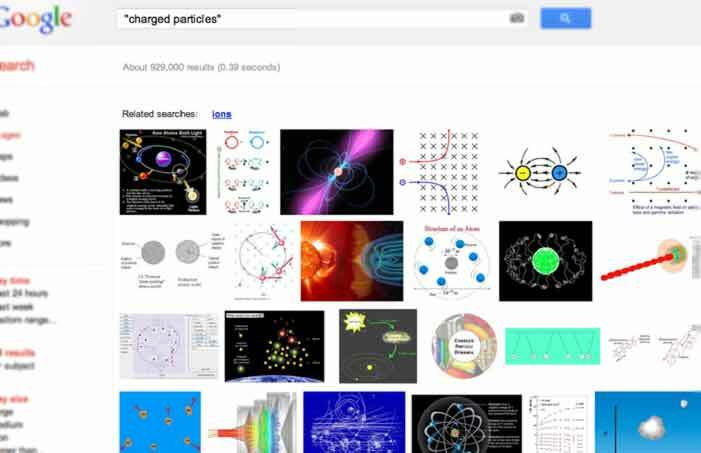 The most interesting characteristics can ultimately alter expected electromagnetic fields as shown here. It certainly causes different responses and can do so in a variety of ways. I want to elaborate more at some point. Non-linear thinking: Instead of visualizing relatively straight line concepts like pointed fingers... Think of the observed, uniformly-radial direction of a gravitational field. All force lines motivate inwardly at equal strengths, (globally close to the surface of the planet). Whereas the magnetic lines vary in strength and direction upon the planet's surface. Next consider the galactic force field and how might such fields interact with constituent suns? Are the force fields identical within the spheres of influence, for planets, suns and galaxies? Or could there be a "polarity twist" to be found between each level? Such that the planets actually rotate by a spinning sun field? Thence the suns are propelled by a galactic force field? Then are the atoms empowered by some sort of a twist progression at the far extreme? Empowered by the prime mover chain of forces emanating from galactic fields? Are the currents then, the waves, particles or polarity twists of an ulterior hologram encoded galactic-ally? This building- experiment suffered from obviously poor electrical connection. Wrinkles of tin foil (above), as concentric laminated layers seemed hopeless. The basic concept emphasizes full, smooth, geometric and electrical continuity at all points along each reflexive rim. 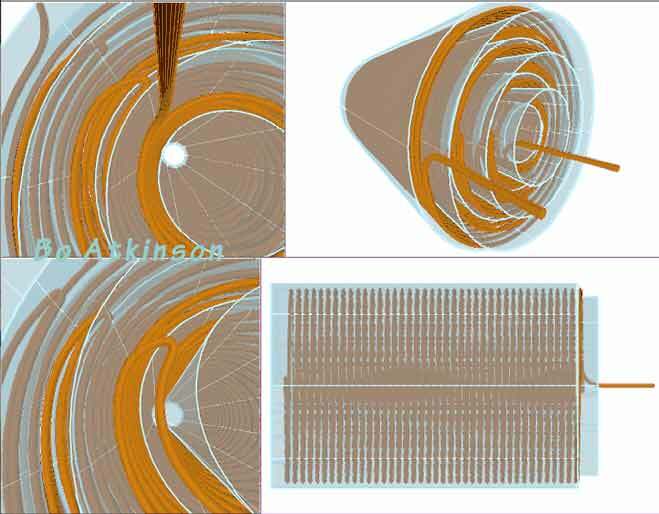 Folding sheets of material distorts concentric cylindrical rolling: Use of ordinary materials results with inner layers compressing into wrinkles. Sheet materials prove very challenging, for both cylinders or for spheres. 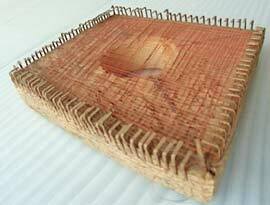 This sort of construction was not satisfactory, with ordinary materials. Nevertheless, pushing forward with this concept, i expect that suitable materials could be found. Continuation of my printed coil "thought experiments", March 2013, modeling for a transversely wound and folded coil. The difficulties of actually building a uniform conductivity inspired a solution using ordinary magnet wire spiralling it's way , as yet another option. This is a spherical version of the mu-metal experiment further above. This concept originated from my first 3d CAD modeling in 1994. With software improvements, this wire version became possible to better visualize. 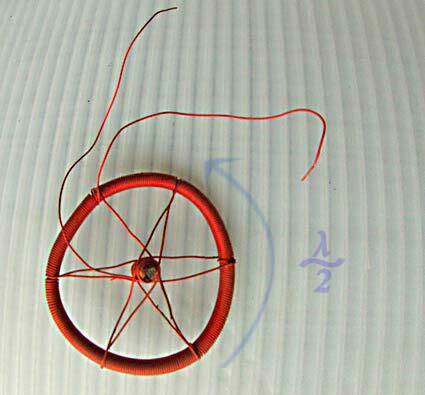 The model below substitutes the solid, concentric, series, conductor shells with a coil of wire. Where this spherical coils are separated by the inverting (reflexive),sequence of concentric magnetic cores. 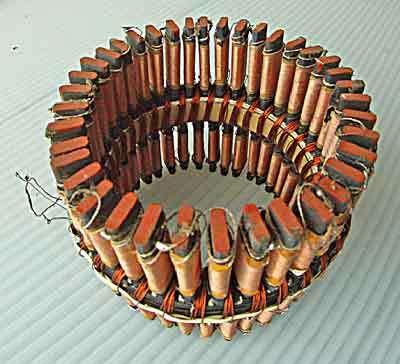 The actual construction of the above model seems readily possible: Ordinary copper wire could be spirally wound in concentric layers. 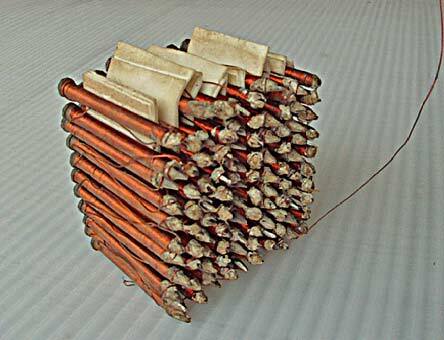 One or several parallel copper paths could be used (to vary Tesla's inter-winding capacitance principle). 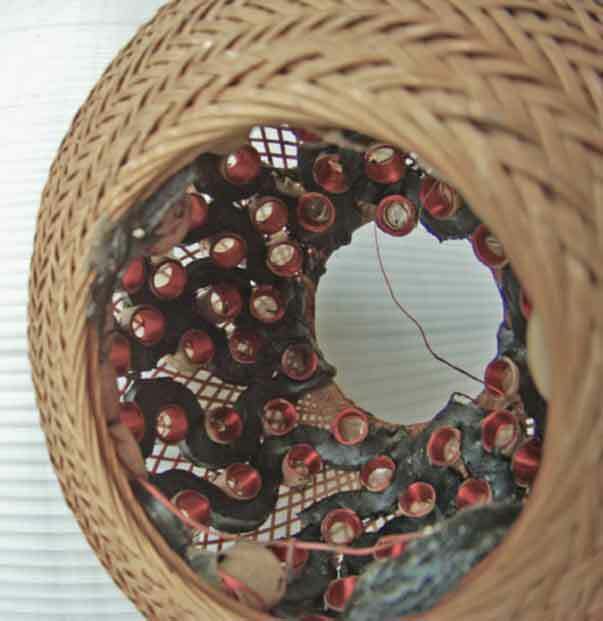 The magnetic core portion could be composed of powdered ferrites for higher frequency uses. Or perhaps powdered metals for lower frequencies and higher magnetic susceptibility. Binders for these might be cements or perhaps resins. This choice has much to do with the workshop handling of fumes and drying or curing. Thermal bonding also comes to mind, though my own means are too limited. 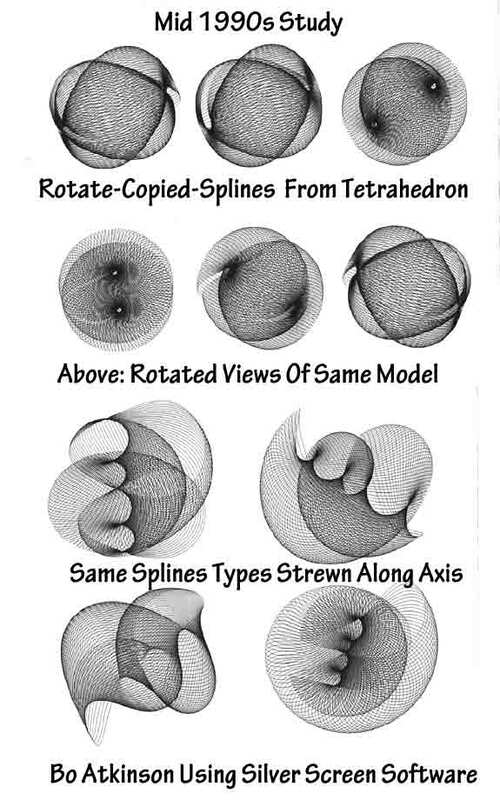 The spherical form can fairly directly be layered and wound successively, all by hand. A curious feature is added by the coiling which is orthogonal or 90º to the originally conceived electrical path.... One point of interest is that this coiling method significantly lengthens the electrical path-- This feature provides more innate 'inductance' which provides for lower electrical frequency resonances. It should provide for more results in the lower frequency capability of my tools and equipment. A full wave or quarter wavelength is easily fit into a hand-sized unit. A divided-coil-core aspect i explored is fractionated-coil-cores. This was not multi-angular core-sharing-- Instead it was an idea of dividing a core into parts, to alter the wave-length of associated cores. The aspect of converting and mixing the given working frequencies spurred these thoughts. The geometric scale of associated core arrangements connected some thoughts of atoms having nuclei as cores for the circulating electron concept. I will continue to summarize my thoughts and experiences with coils on this website. Links will be added here, to additional pages in future. I have been reserved because energizing these coils has initiated to many ramifications. None of which was particularly worth focussing upon. Small advantages of inductance improvements or efficiency tests were skipped over. 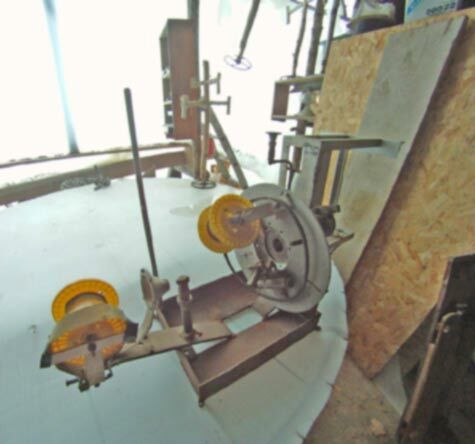 My time focussed on coil forms and construction methods primarily. The response types which caught my attention most were the harmonic wave outputs, sometimes evident. I don't have the typical "Comments" software available to invite comments... My loss due to starting these pages in the 1990s and investing my time learning older webpage software. A time when merely saving or sharing a small computer files was expensive. Web delivery issues demanded very low resolution images, many of which are still on this site. Work files were typically too large to fit on the floppy discs, (which were the typical storage discs in the 1990s). I had studied electronics technology due to a long interest. I had briefly learned that Tesla was suppressed and his research had been compromised, long before the end of his life. This was a discouraging example. Of what is likely to happen, in case a person actually discovers something of value. Things of value are soon grabbed at and hard to manage. As an alternative ,i sought to share all my ideas freely. 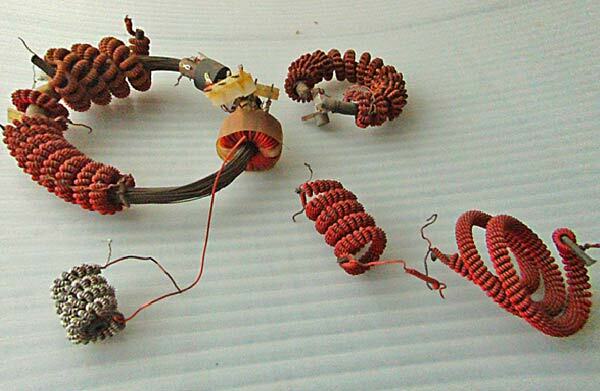 My coils need comparing with ordinary coils, in terms of wire lengths, inductance and other parameter verifications. I never got that far and instead prefer continued, inspired exploration of pure geometry. I have always needed to focus on making a living with my rural trades. So i spent most of my time trying to develop and market income producing work. But the artisan-builder rarely makes much income. Free time therefore allows the inventive spirit to enjoy pure modeling. My 1980 experiments with feable currents and coil geometries. Following are my only "officially recognized diplomas". I am actually a life long student of many art forms.